After the success of LeTV Le 1S and the launch of Le 2 Series, the company now plans to launch the LeTV Le 2S and without any surprise it will be available through Flash sale on Flipkart. 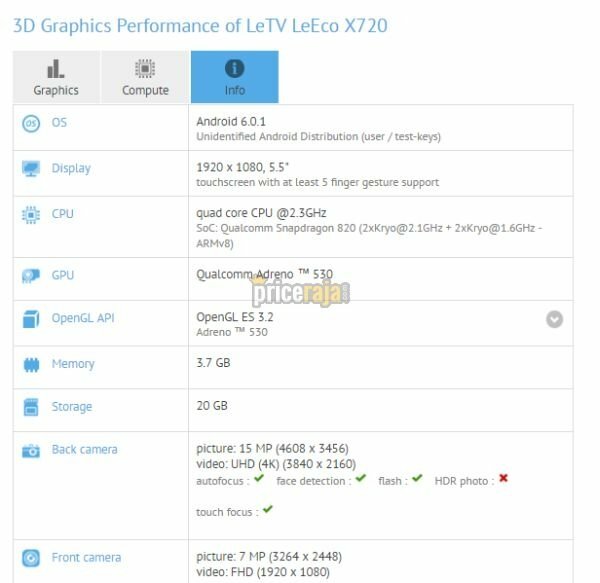 LeTv Le 2S is currently rumored and as on August 16 it got GFXBench approval. While passing through the benchmarking, several major specifications of the device were revealed. In terms of hardware we will have Snapdragon 820 chipset clocked at 2.3 GHz and 4 GB RAM as opposed to earlier rumors of 8 GB. In terms of display we have the 5.5 inch full HD display. LeTv Le 2S will be competing with the likes of OnePlus 3 and Galaxy Note 7 in the budget range. Disclaimer: Specifications for LeTv Le 2S were entered manually. Technos Amigos doesn’t guarantee of 100 % correct information. If you find some mistakes, please report to us, using Contact Us page.